Growing: Easy â€” Moderate Crop King Seeds took the Alaskan Thunder Fuckâ€™s durability and made a simple strain to grow so that it can fit to any grower including the beginners. Rogue Thunder is a 50% blend of both sativa and indica with buds which are coated with delicate crystals and orange hairs. 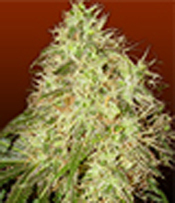 Rogue Thunder is perfect for appetite and pain relief effects thus this is good for medical purposes. The effect is a complete body buzz to a euphoric high but it still maintains coherency. This is just very easy to grow thatâ€™s why any grower would want this strain in their marijuana garden. The effect is just too great for an easy to grow weed strain. This cannabis plant can grow to any given growing condition for as long as proper growing style is used. Any grower can harvest in just 8 weeks with a moderate to high yield which is filled with high content of THC.